Bigger isn’t always better. These sleepy small towns with outsize personalities offer an alternative version of summer down the Shore. The neon-trimmed excitement of The Wildwoods draws around nine million visitors each year to Boardwalk amusements, packed beaches and Doo-Wop landmarks. Very few of them, however, make it to West Wildwood, a tiny island community huddled on just 0.3 square miles. “Charming” is a word heard often when West Wildwood is the topic of conversation. But, truth be told, it doesn’t really come up a lot—and its inhabitants and visitors are just fine with that. Along with a handful of other tiny beach towns scattered up and down the coast, it serves as a portal into the forgotten Shore of years past—where jostling Boardwalk crowds are replaced by quiet, shaded streets and tourists give way to longtime neighbors who know one another by name. This is our guide to the insider’s Shore, for those who crave peace, quiet and a glimpse outside the usual haunts. 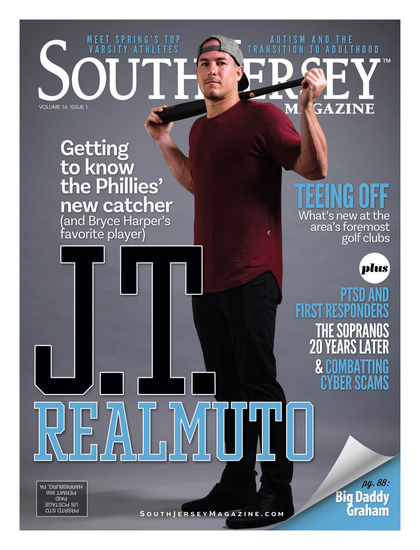 Think you know the Shore? Read on. Trapp works for the Greater Wildwood Tourism Improvement and Development Authority, but relishes leaving behind the thick throngs of vacationers each day as she heads back over the two-lane Glenwood Avenue Bridge and into the cozy enclave she calls home. 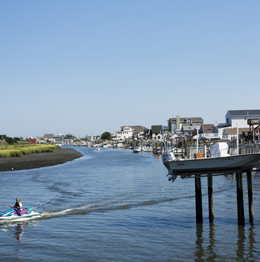 Just four blocks wide and about a dozen long, the developed half of West Wildwood boasts all of one liquor store, a church, a mini-golf course, a kennel and a veritable boatload of marinas. Its only restaurant was torn down six years ago and replaced by condos. But new owners of the borough’s lone watering hole—the Westside Saloon—recently renovated the establishment, adding an outdoor patio and a modest menu of bar fare. The oddly shaped structure stands as the only remnant of a once-lively pier and casino, de?stroyed —along with more than 100 houses—during a 1962 nor’easter that brutally battered the island while sparing its counterparts across the bridge. Yet life goes on, and these days the saloon is the social lynchpin of the community, frequently hosting all-ages events and theme parties. Half of the island is preserved wetlands. Where development is allowed, strict zoning codes prohibit commercial construction and limit residential real estate to single-family homes and duplexes. West Wildwood’s citizenry prefers it that way. As summer vacationers veer off the Garden State Parkway and cruise down Avalon Boulevard toward the dune-studded coast, few even notice the turnoff for the quaint, bayside hamlet of Avalon Manor. The island’s two square miles house around 150 homes, most of which sit nestled along the scenic, snaking inlets of the Intercoastal Waterway. There are no eateries, bars, hotels or even convenience stores—just a marina, myriad docks and a whole lot of boats. “People who live or have houses here are more fishing-centric than beach-centric,” muses David Spangler, who bought a home on the island in 2008. For years, he and his wife vacationed in Ocean City. But, as they grew older, the crowds and hassles of the teeming tourist town got, well, old—even though their love of the Jersey Shore remained strong. “We wanted to be on the water,” he says, “and we also wanted to be away from it all. When we found Avalon Manor online, it seemed perfect for our needs—and it’s actually been even better than we imagined.” Spangler cites the congeniality of his fellow islanders, the stunning views of the bay, and perpetual peace and quiet as the community’s best attributes. A province of Middle Township, Avalon Manor is connected to the mainland by Old Avalon Boulevard, and to the Borough of Avalon by a narrow bridge that turns into 21st Street. As such, residents are just a brief walk, bike ride or drive away from the retailers, restaurants and attractions of their popular neighbor to the east. “Where the hell is Strathmere?” It’s not just a legitimate question for the average New Jerseyan; it’s also the town’s unofficial tagline, seen on bumper stickers and T-shirts across this quaint, relatively spartan slice of a town sandwiched between Sea Isle and Ocean City. There are no high-rises or banks—just a handful of bars and restaurants, a general store, a boat-rental outfit and a library that was gifted to the community by a longtime summer resident. Its idyllic nature, despite the clamor and congestion of neighboring hotspots just minutes away in either direction on Ocean Drive, has earned Strathmere the loyal patronage of return vacationers and the pride of its fewer than 200 fulltime residents. “I think Strathmere is the best-kept secret of the Jersey Shore,” says Linda Brown, whose family owns the storied Deauville Inn. Dating back to the late-1800s, this bayside tavern operated as both a speakeasy and casino during Prohibition, before being pummeled into disrepair by the nor’easter of ’62. In 1980, Brown’s parents bought the inn and painstakingly restored it to its former glory. Now operating year-round, the inn has multiple bars—including one that’s consistently ranked as the Jersey Shore’s best place to watch sports—a dining room overlooking the water, outdoor tables in the sand, and dockside service where boaters can stop to order drinks and snacks right from their vessels. Across the inlet from Island Beach State Park, Barnegat Light is one of Long Beach Island’s least-inhabited sections. With a population of fewer than 1,000 people comfortably packed into a single square mile, the borough’s ace in the hole is Ol’ Barney, New Jersey’s most photographed lighthouse and the second-tallest one in the country. Visitors to the historic site ensconced in a state park can climb to the top of the 152-year-old deactivated light tower for a spectacular panoramic peek at the Shore. Nearly 40 boats bob along a sprawling assemblage of docks not too far from Ol’ Barney at Barnegat Light’s Viking Village (19th Street and Bayview Avenue), one of the East Coast’s largest fresh fish suppliers, distributing $25 million worth of seafood products each year. In addition to free Friday morning dock tours in the summer, visitors flock to its row of shanty-style antique shops, boutiques, cafes and fish markets. Even movie buffs will be satisfied, as Viking Village dock is also home to the Lindsay L, the fishing vessel that portrayed the ill-fated boat in the movie The Perfect Storm. Head into the heart of the community—say, 10 W. 25th St.—and there sits another legend: Mustache Bill’s Diner. The classic, terrazzo-floored ’50s eatery was the first diner in the nation to receive an “America’s Classics” award from the James Beard Foundation—and that’s saying something in a state with more than 600 diners.